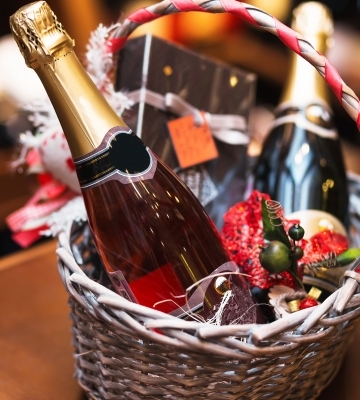 Holiday gifting can be wearisome and costly, particularly if you have lots of friends and family. Trying to decide who will like what is a chore in itself, let a lone keeping within budget and giving meaningful presents. There’s a gift that fits all, that is delicious and healthy holiday treats! Give your loved ones’ nutritious goodies that will warm-up their hearts and home this holiday season! 1. Peppermint chocolate granola – Share love this holiday with delicious homemade granola. Mix nuts, dried cranberries, raisins, cinnamon, peppermint, dark chocolate chips, and seeds with oats. Then bake in the oven for a delicious granola treat! Oats are high in fiber, which helps lower cholesterol and aids in digestive health. Nuts and seeds also add omega fatty acids and vitamins to the granola mix for a nutritious snack. For recipe details please click here. 2. Tropical organic fruit basket – Get creative with your baskets adding organic fruits like, mangos, papaya, bananas, guava, pineapples, strawberries, kiwis, and others. These festive baskets can be used as center pieces and served with deserts at holiday events. Fruits contain essential vitamin and minerals for health and wellbeing. 3. Gluten-free vegan chocolate chip cookies – These cookies are a yummy treat for vegetarians and people on gluten-free diets. After baking, cool cookies and place inside a festive holiday box. For recipe details please click here. 5. Dark chocolate – Chocolate lovers can enjoy a treat this holiday season. Unlike white or milk chocolate, dark chocolate is high in antioxidants. Antioxidants fight molecules known as free radicals, which are harmful to cells. When selecting chocolates for friends and family go for the dark. 6. Tea gift sets – A heavenly gift for tea lovers! Most sets include an assortment of wholesome teas to sample, along with a mug or tea infuser for tea making. You can also make your own gift sets with wellness teas and other healthy products. 7. Cinnamon glazed almonds – Almonds are packed with nutritious properties! Almonds are high in vitamin E, fiber, and monounsaturated fat (healthy fat) that helps decrease cholesterol. “A daily handful of almonds together with other foods containing phytosterols may offer some protection from heart disease by decreasing LDL, or "bad," cholesterol”, notes the Dairy Council of California. The key is moderation. A handful of these tasty nuts can be a healthy alternative to cookies and other sweets.